Nissan Motor India Private Limited, the Indian subsidiary of Japanese autogiant Nissan, owns a fleet of vehicles, belonging to almost every segment from hatchback to SUV in the country. In the entry-level saloon segment, it offers the Sunny sedan which is truly a royal wagon to drive. 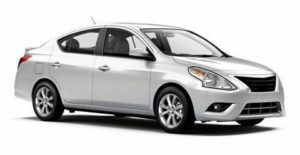 Nissan Sunny hit the Indian shores firstly in 2011 and it was received considerably well by the auto freaks in India. But along the course of time it lost its glory and hence, in an awe to re-create the enigma and panache, the company has launched the second generation of the entry-level saloon in the country being cited as ‘Nissan Sunny’. It is more promising, advanced and striking than its predecessor and looks complete. View offers on Nissan Cars from Nissan dealers in Hyderabad at Autozhop. Everything about the Sunny is big. The headlamps were big and are same, just that they are much more curvy and well designed now. Nissan are calling this the new Boomerang headlamps. The grill is entire chrome with chrome strips. And a large Nissan badge in the centre. The bumper is huge and rises all the way above the grill and onto the bonnet. The bumper to houses a grill in the centre with fog lamps on either side and that too has chrome strips. I don’t think I have ever mentioned chrome so many times as here. Looks like Nissan got a wholesaler. From the side as I have mentioned before the cabin area looks huge. The doors are large with large windows. They took Seagram’s line “Make It Large” a bit too literally. The mirrors now get side indicators. The silver alloys blend well with the chrome yet again on the door handles. The C-pillar appears like that on a notchback and even the boot has a large look to it. The tail lamp flows well from the rear panel to the bumper. And guess what? chrome yet again on the boot lid with the Nissan badge. The rear bumper has a nice fibre lip adding to the classy look. The new Nissan Sunny 2017 does stand out. The steering design is the same three spoke steering but now has a shiny silver strips on the side which houses steering mounted controls for the infotainment system on the left side. The instrument cluster is also the same with tachometer on the left and speedo on the right. With a small info screen in the centre. A welcome change is the centre console which now has a bigger screen and makes utility very easy. The plastic quality for the buttons too has seem to gone up. Climate control console is the same as before which is a typical round structure with bright orange backlight. Behind the steering you can also spot the start stop button. The rest of the dash is black fibre well laid out and simplistic yet elegant. Now stepping into the back seat. This is where the hidden gem of the Sunny lies. With insane legroom equal to rival limos and the centre hump being pretty low three +size adults can sit as if in a lazy chair. My friend is 150 kgs without exaggeration and he is extremely comfortable. The Japanese automaker Nissan has presented the entry-level saloon Sunny in both petrol and diesel guises. The company has refrained from making any modifications in the Sunny; hence, retaining the engine specifications of the same phased out model. The petrol variants carry a 1.5-litre motor with them which has Electronic Fuel Injection Control as fuel system. The 1498 cc, 4-cylinder, 16-valve engine is being christened as ‘HR 15’. It is capable of churning out a top power of 98 bhp at 6000 rpm with the manual variants while the automatic variant gets an exceeded power of 2 bhp which makes it 100 bhp at 5600 rpm. Though, torque remains common in form of 134Nm at 4000 rpm for both the manual as well as automatic variants. The engine gets coupled with either a 5-speed manual transmission or a XTronic CVT transmission.